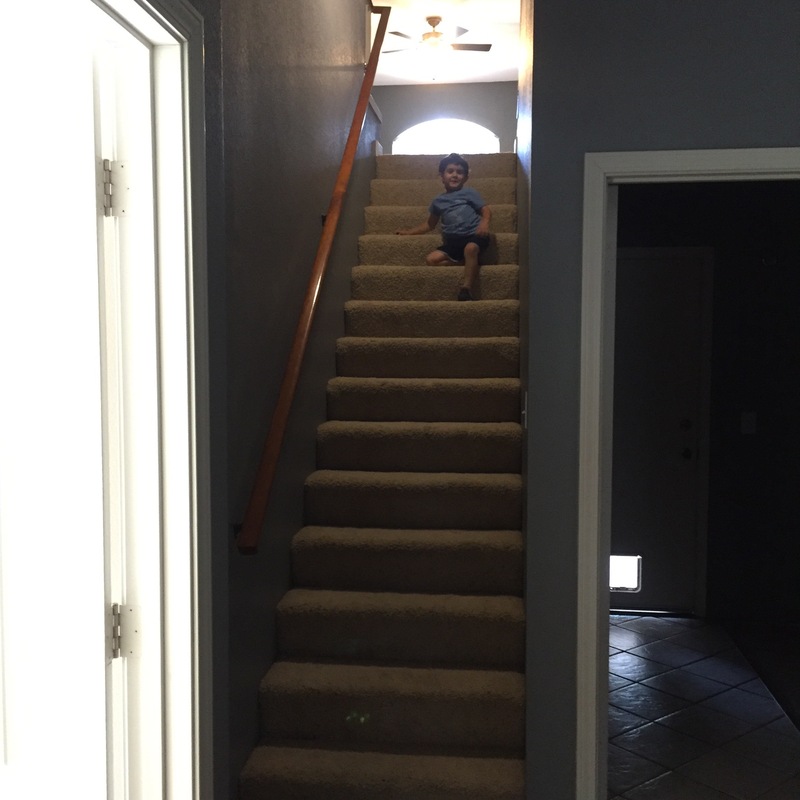 In my last post I took you on a tour inside our new house. Today I want to share the outside yards with you, and talk about what we plan on doing with the yards. 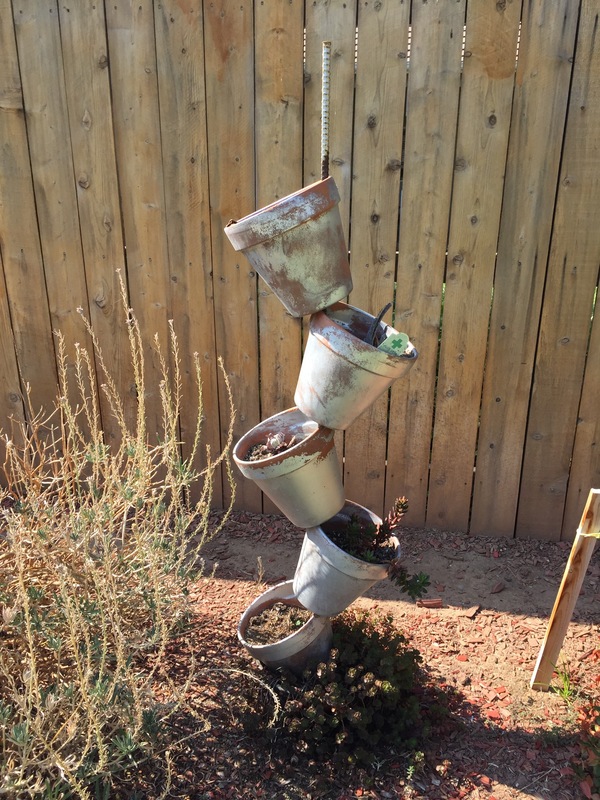 I also want to share some ideas on how to make them a little more drought tolerant AND beautiful to look at. Like most people, we definitely want our outdoor space to be a family friendly, active and usable space! I say that because it’s relatively easy to make a space “pretty” or “drought tolerant”, but not always as easy to incorporate those ideas into a “family environment”. So we will see how this all ends up! Now, onto the yard tours! Walking up to the front door there is A LOT of grass on the left side and bushes as well as trees on the right. 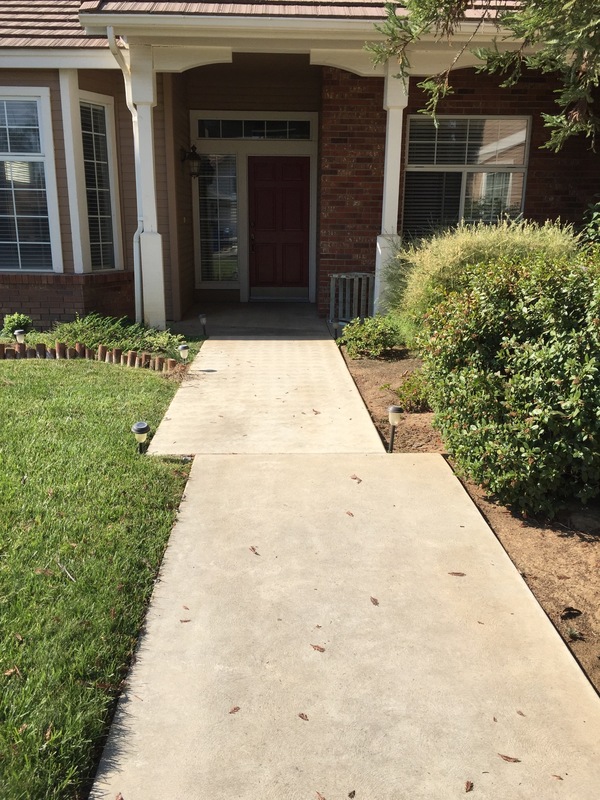 There is a good chance that most of the bushes on the right will be removed, and that part of the yard will become a lovely rock garden with succulents and native and drought tolerant plants (xeriscaping), or it will become “decorative” front patio extension. We are debating on how much of the grass will be removed on the left side since it takes SO much water to keep it lovely and lush. As you can see, the grass at the front corner is dried up. 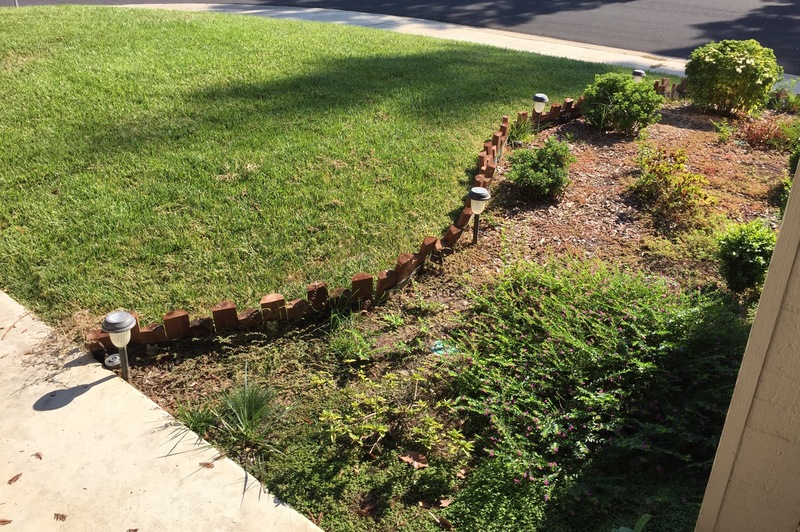 We will be ripping most of that grass out all the way up to where the border is at the bottom of the picture and extending the flowerbed all the way down to the sidewalk. The plants in the flowerbed will most likely be changed out and xeriscaped. As you can see here there is a lot of grass, it actually wraps all the way around the sidewalk to the front of our house. In the back yard there is also A LOT of grass that is dying out in places. 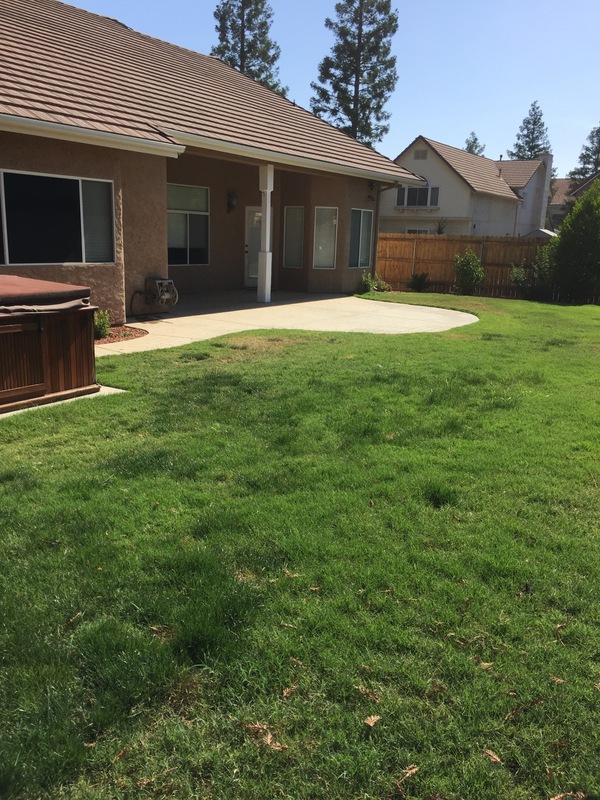 We are planning on pulling out all the dead grass in this picture, and extending the patio out and adding a pergola to create a functional BBQ area and outside dining area, since we spend quite a bit of time outside. This area actually gets a substantial amount of shade during the day, so the grass stays nice and green. I am advocating to keep the grass over here, but we have also tossed the idea around of turning this area into a separate brick patio for lounging, and even possibly a fire pit. Here is my “favorite” (insert sarcastic eye roll here) part of the back yard. 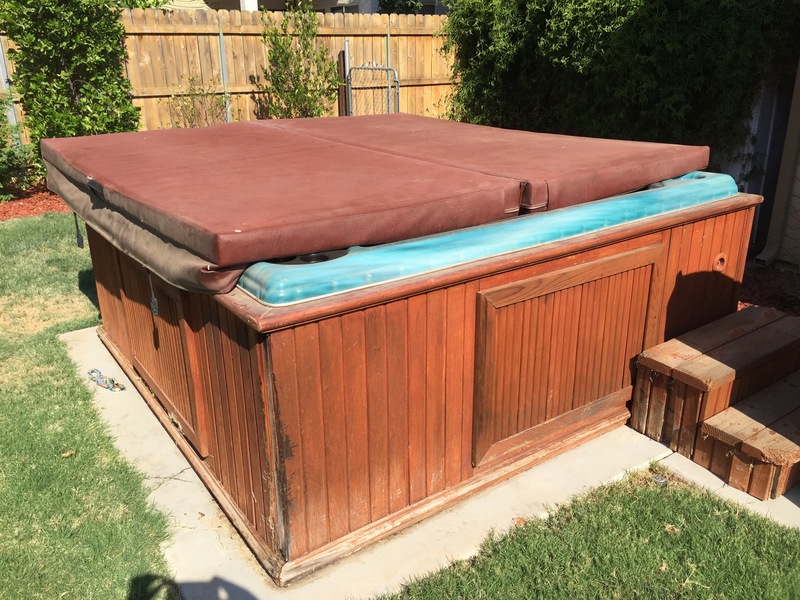 It doesn’t make sense to me to have a hot tub in an area that can gets upwards of 115+ degrees during the summer. Plus, I’m just not a big fan of them. So, it will definitely be removed. 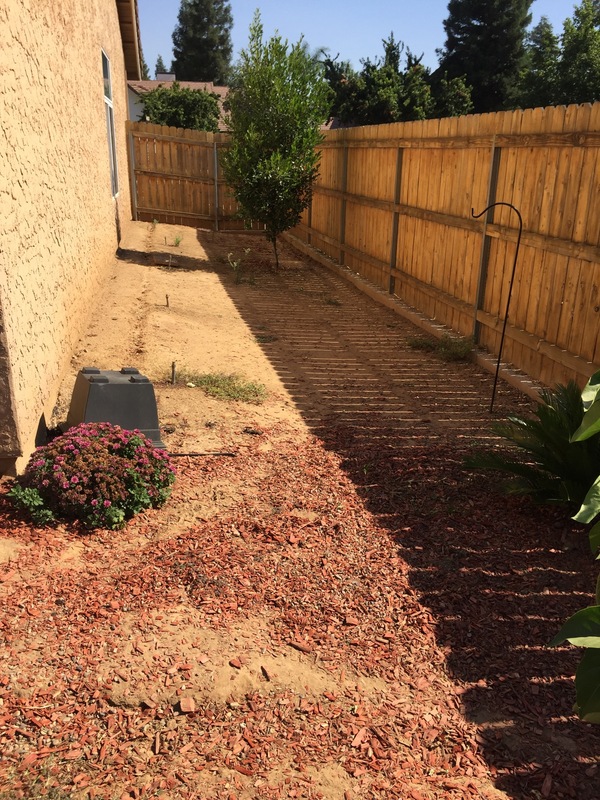 While this area along the side of the house looks super barren and desolate (and drought friendly at this point), I actually have a few ideas on how to make this a comfortable usable space. One idea includes an awesome brick patio and pergola that runs the length of the house. Another idea includes planter boxes and a cute little (drought tolerant) veggie garden. We were also bequeathed with this back yard decoration. While I like the idea of it, right now it is looking a little down trodden and junky. I think I may give it a little face lift and add some more succulents to bring it back to its former glory. So as you can see, we have a lot of work ahead of us. I am excited to incorporate xeriscaping into our new neighborhood, and hopefully will inspire others to do the same! 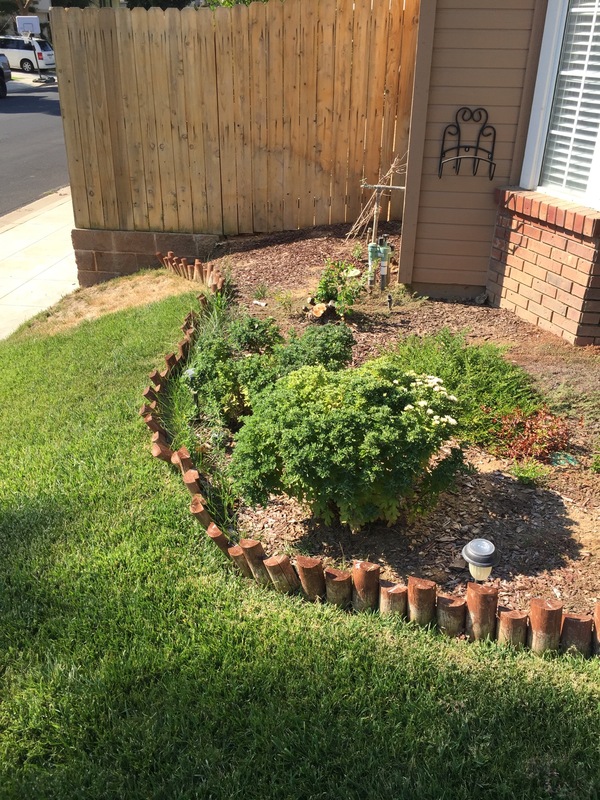 Not only is it a fantastic way to utilize drought tolerant and native plants into your yard decor, it can also be really beautiful. For us it just feels like the most responsible way to keep our yard looking pretty. I found some great sites like Growing Nature, and California Native Plant Society for native plant ideas in our area, but if you do a quick Google search you can find lots of sites that will tell you the plants native to your area. I can’t wait to share our progress, and would LOVE some suggestions on yard/landscaping ideas! 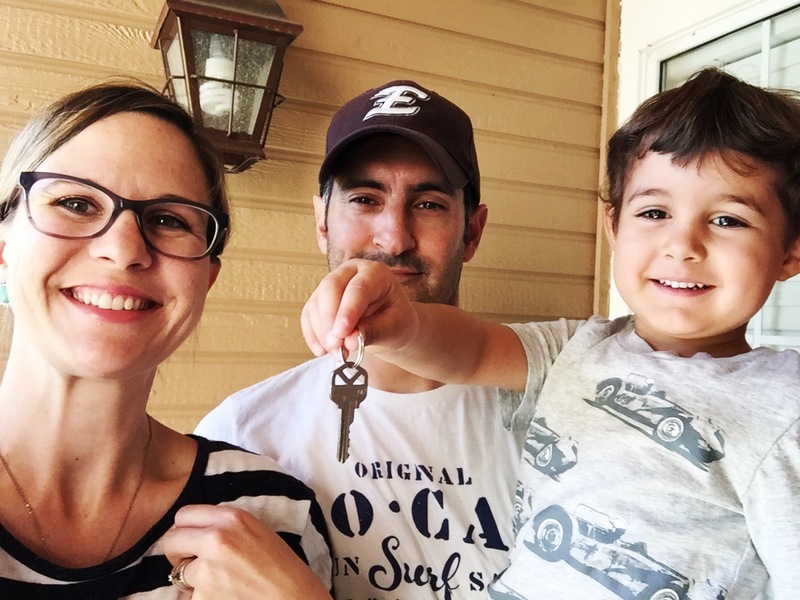 As many of you know, we recently just purchased a new home! Well not a brand new home, but a new-to-us home. It’s a bit older (built in the early 1990’s) with all of those charming 90’s details, including: decorative gold/silver faucets, white tile with grey-beige grout in the bathrooms and kitchen, faux “marble” cabinet and drawer liners, black kitchen appliances, built-in wood cabinets with that popular 90’s golden brown stain color, and the piece de resistance– a forest green jacuzzi! Kitchen- the old faucet HAS to go. It drips and almost won’t turn off- not good for the pocket book or the environment- we are in a drought! 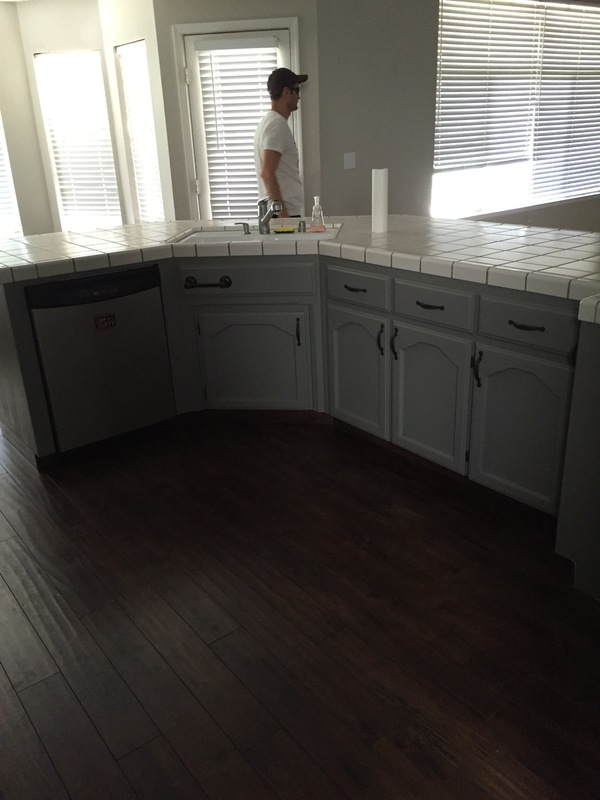 We will be replacing it with a gooseneck faucet in an oil rubbed bronze color to match all of the hardware on the cabinets and drawers. Full Kitchen (during move-in)- I actually like the colors that are used in this kitchen. 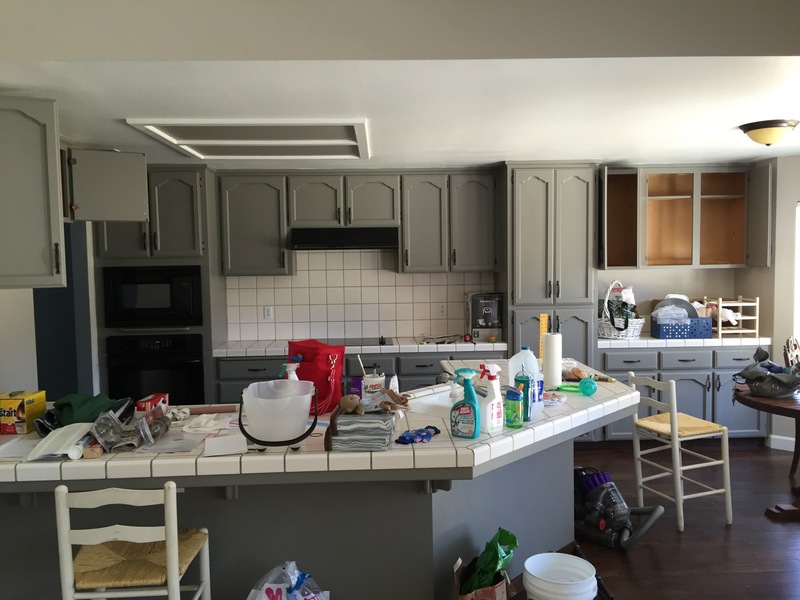 Eventually we will update the white tile with a granite countertop, and I will be removing and replacing ALL of the dirty faux marble lining in the cabinets and drawers. We also plan on adding some pendent lighting above the “bar” area. 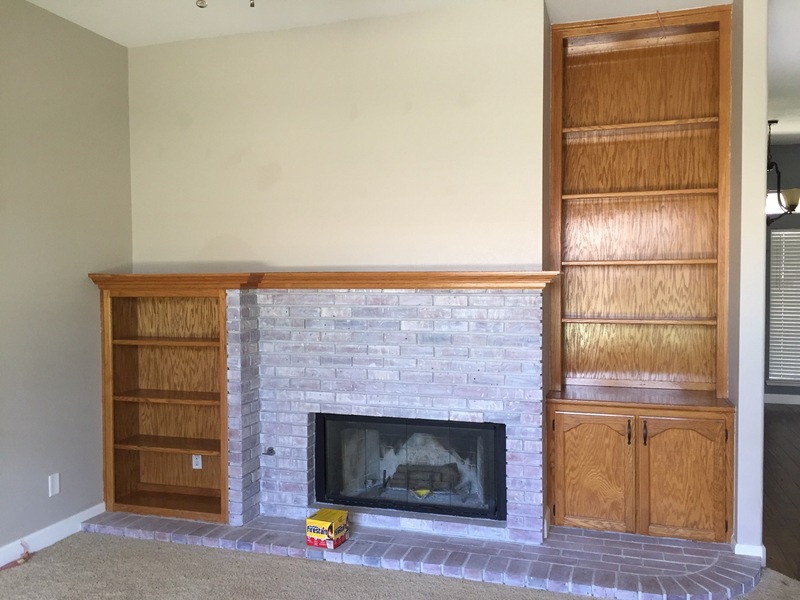 Family Room Fireplace- the fireplace and mantle just feel dated and that golden brown color doesn’t really flow well with the whitewashed brick, or the dark wood floors in the rest of the house. 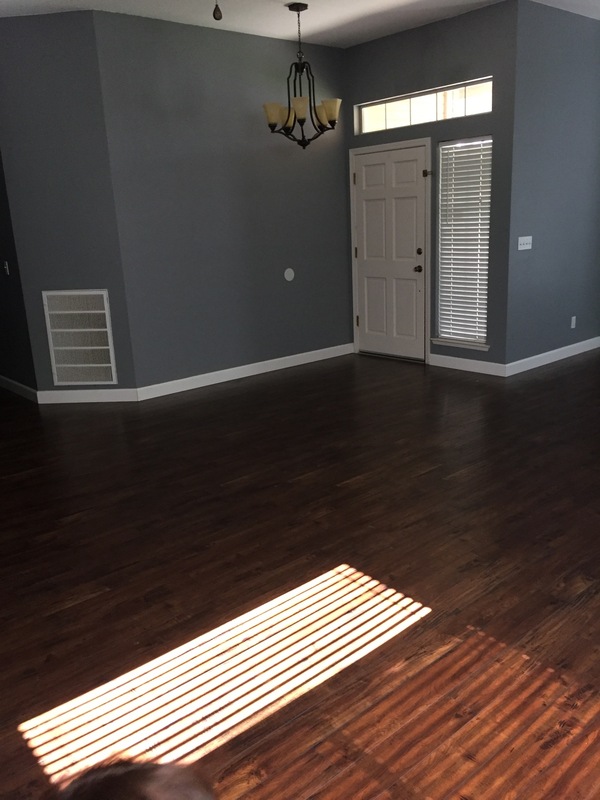 I plan on painting the wood a bright white to help coordinate the room, and give it (and the rest of the house) a modern beachy/boho esthetic. 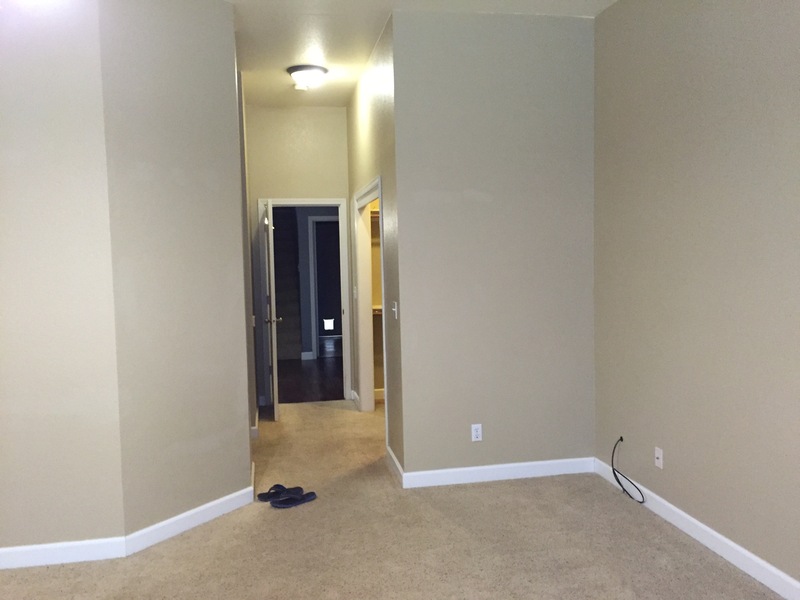 Hallway (cabinet)- the whole hallway is painted the same color as the dining room, the “loft”, and office/sewing room. While I really like the color, it makes the hallway feel closed in and dark. Eventually we will brighten it up with a lighter color. I will also paint the cabinet a bright crisp white to freshen it up and give it that “chill beachy vibe” I just love so much! 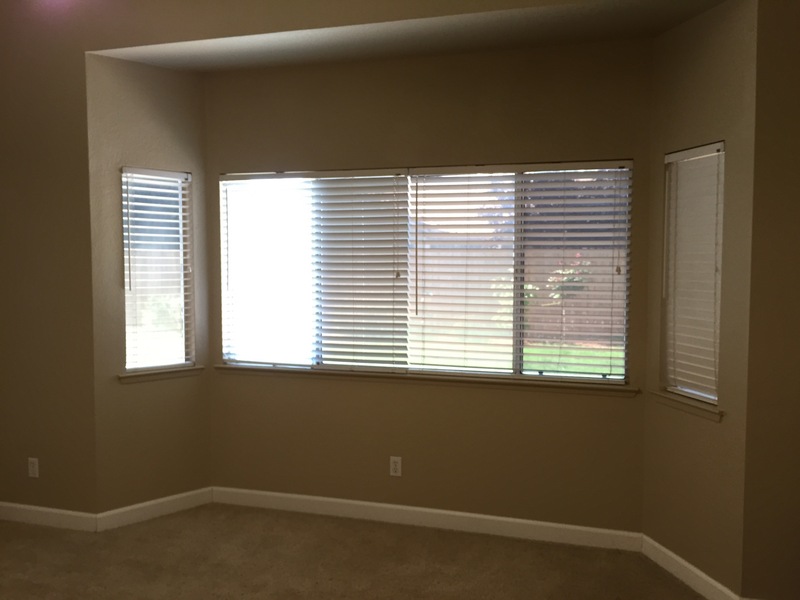 Master Bedroom- in this picture as you can see the room is a neutral tan color, pretty much matching the carpet. Boring! 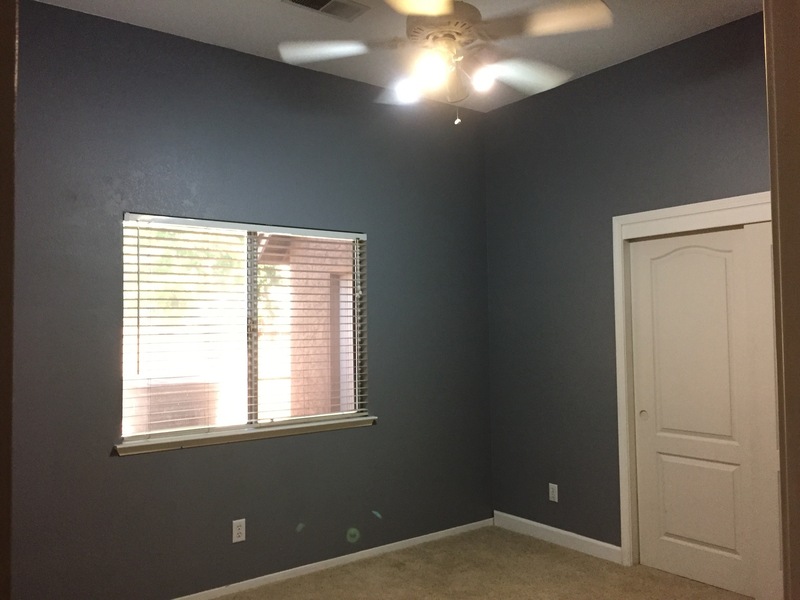 First we will paint the whole room a nice light grey-blue to evoke a peaceful “beachy” vibe. 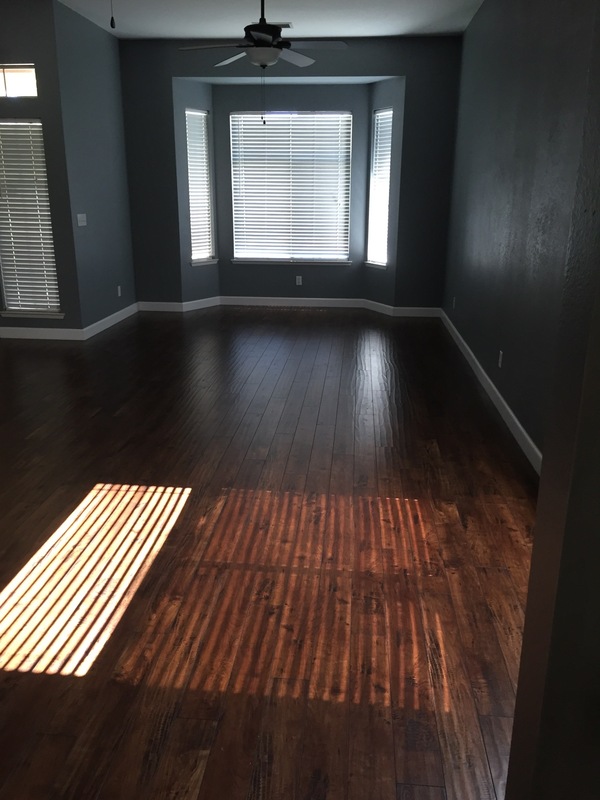 Eventually we will also add hardwood instead of the carpet. Master Bedroom- (Alcove) This will be repainted a nice bright white to help brighten up the room even more with the light grey-blue we are going to do the rest of the bedroom. 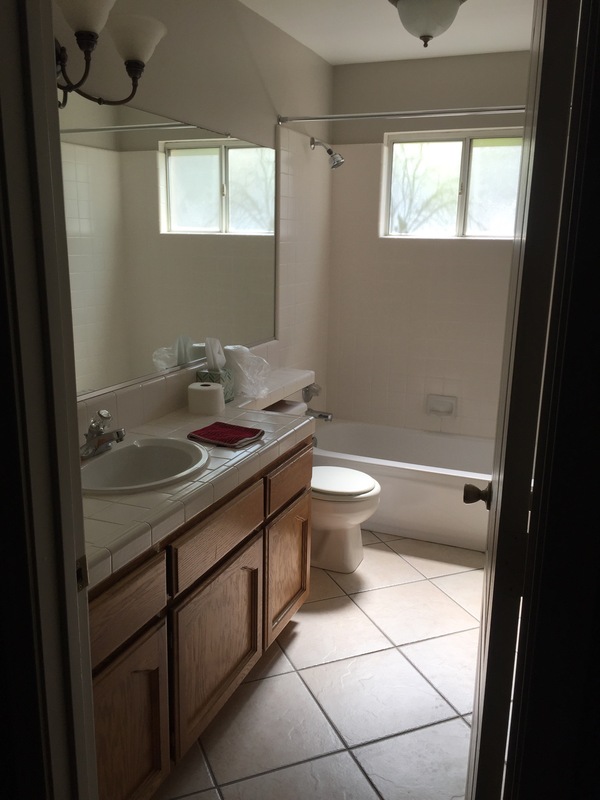 Master Bathroom- where do I even start in this room? 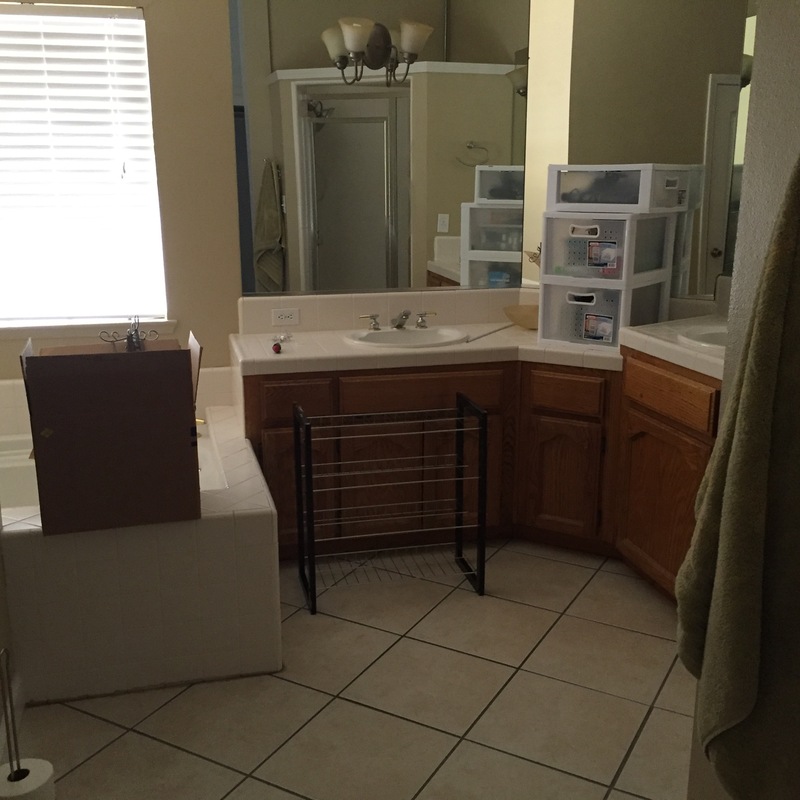 This may be a “long-time-coming” project because I want to totally redo everything about this bathroom! 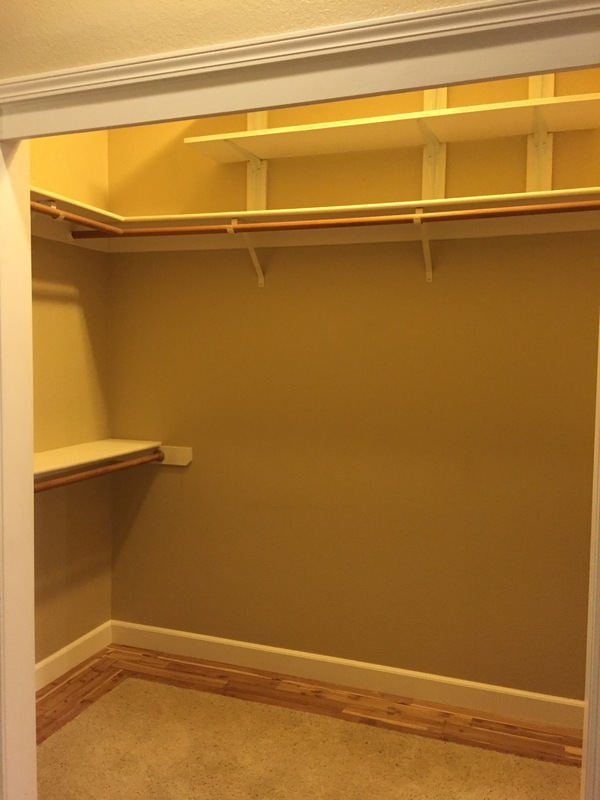 Master Closet -No your eyes are not deceiving you, the light in the closet made everything look yellow! (Yuck!) 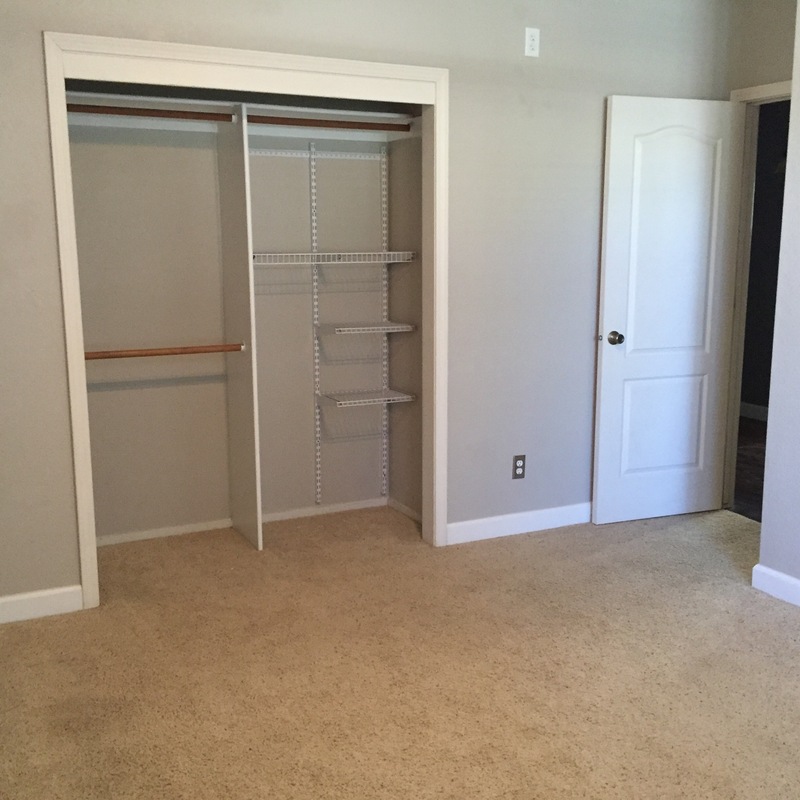 The closet color actually matches the master bedroom and bathroom, and will be repainted (a nice serene light color), and the light fixture and bulbs will definitely be changed out to give a pure bright light. 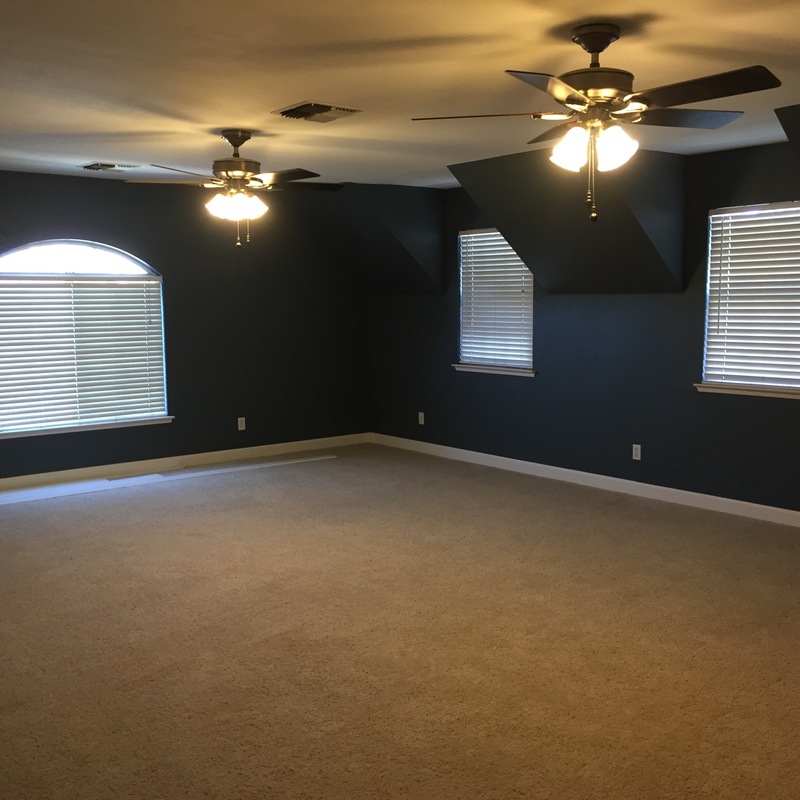 Office/Sewing Room- this room feels dark in this blue color because it’s on the small side, and the light fixture is old and noisy. I plan on eventually painting at least one wall a lighter color and updating the light. 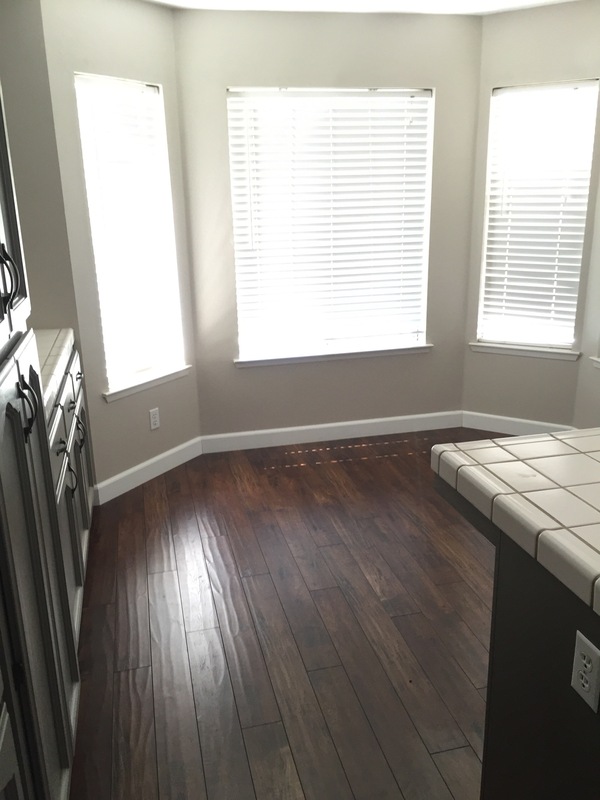 I will also finish matching the mounding at the baseboards. 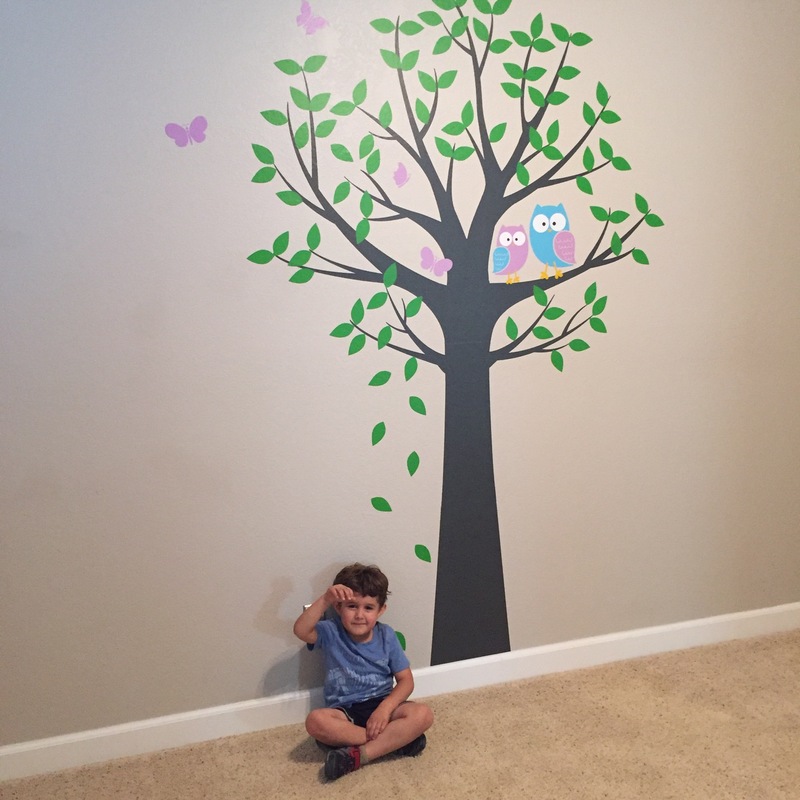 This will be kiddos room! Hallway Bathroom- we will definitely be painting or replacing the cabinets, as well as updating the old faucet. 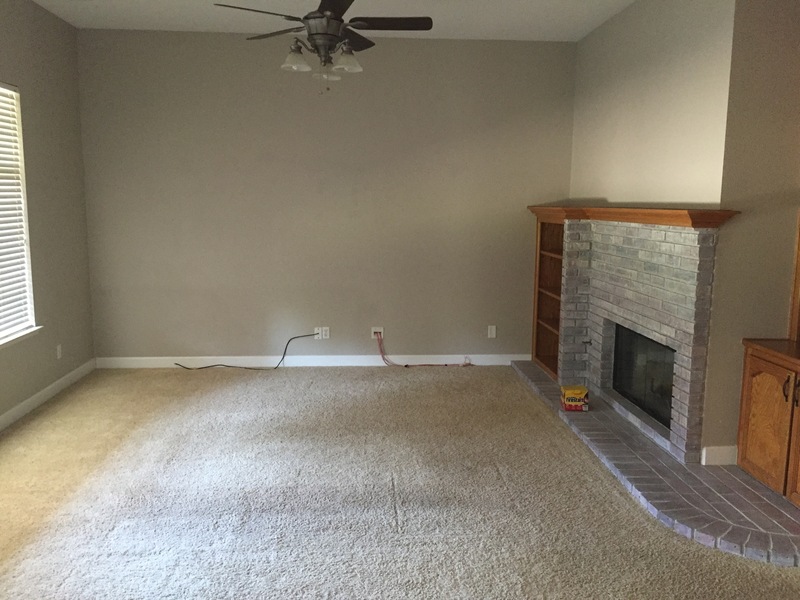 This room is also in desperate need of a vent fan! 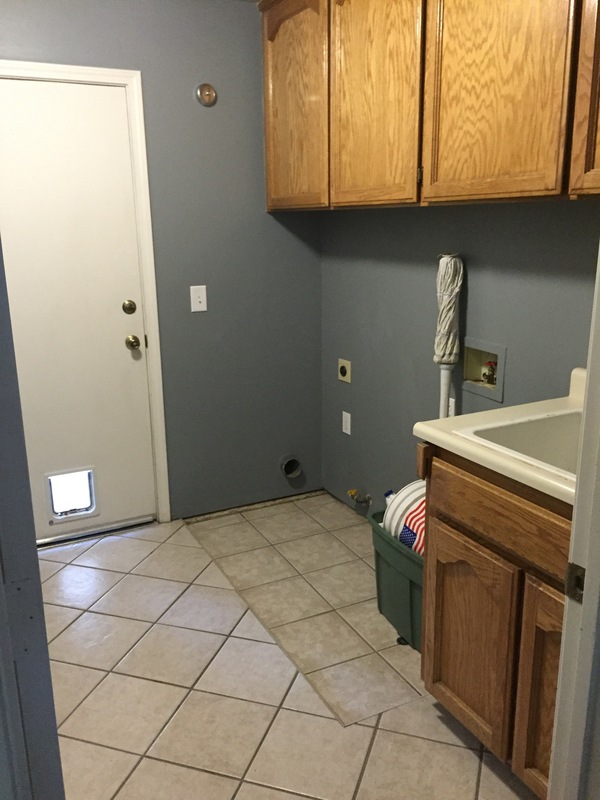 Laundry Room- we purchased a new washer and dryer (obviously not pictured), and the door was replaced with a fire rated door that does NOT have a doggy door! 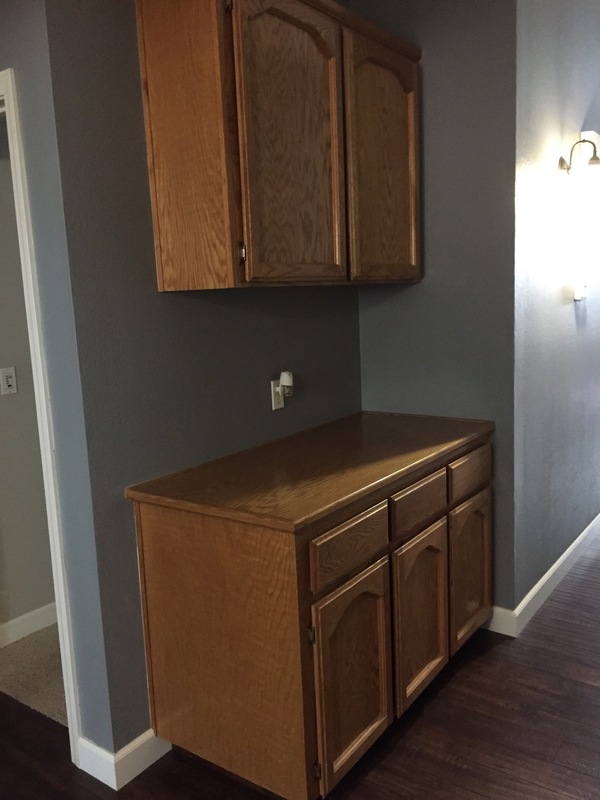 Besides that, we will be painting the cabinets. Looking into the loft from the stairway- the color on the walls look really dark, but it is actually the same color as the formal dining room area and hallway. 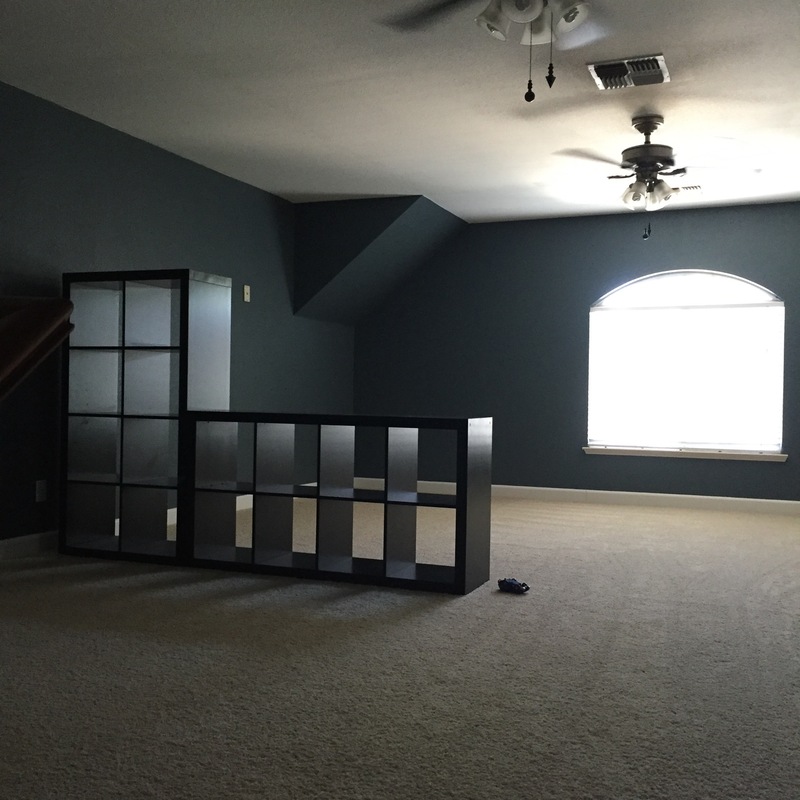 I can’t decide if I want to repaint this big room or not. 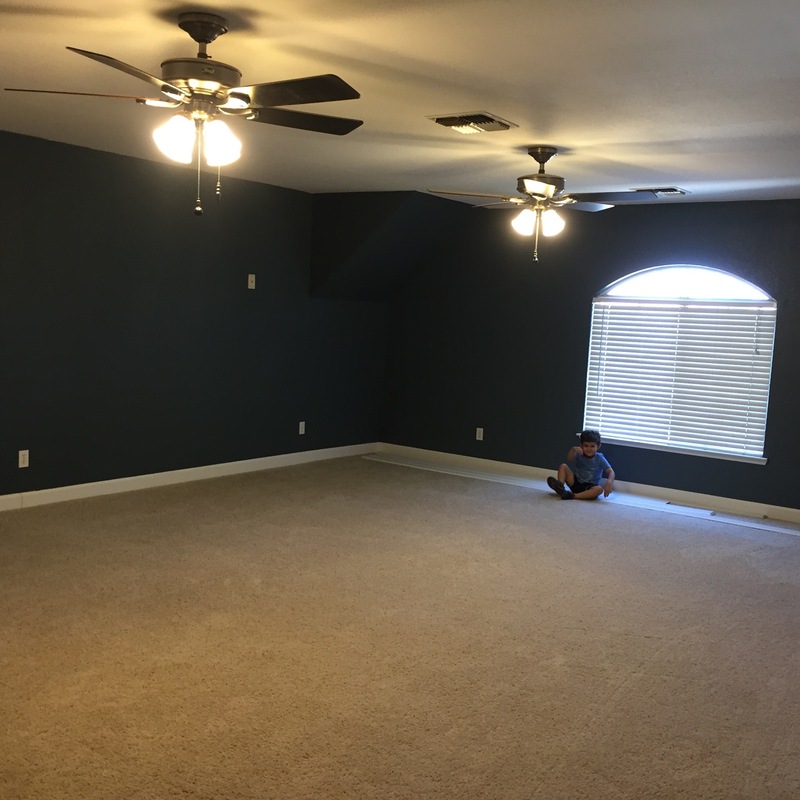 I have a handful of ideas on what to do with this space including a “guest suite” as well as a playroom/man cave, or even a legitimate library/study! I just can’t decide! I am truly loving working on making this house a beautiful home, and I am super excited to share the process with you! Next up is the outside of the house! 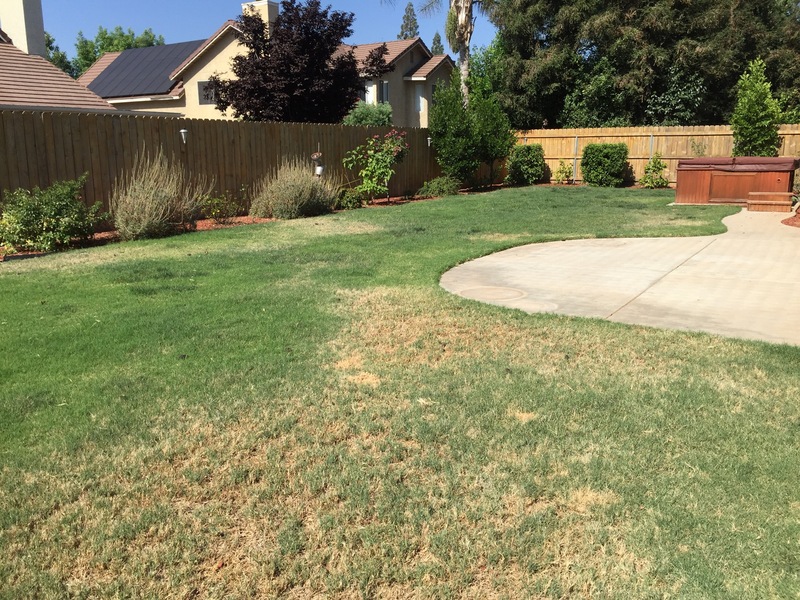 I have some really fun ideas on how we are going to make our yard(s) more “environmentally friendly” since we are currently living through a serious drought.